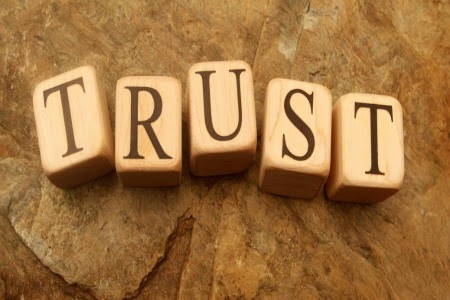 When I first chose the word Trust for my word of the year, I chose it because the past 9 years have been an extraordinary challenge for me and my husband. When things would continue to spiral downward, people would find clever ways to let us know that we were not suffering properly..
–someone once wedged the CD and Book, The Secret between our front doors, letting us know that we basically caused all of our own struggles. –our mail box once contained “The Power of Positive Thinking” I suppose, for the same reason as we got the materials jammed in our front door. –people would tell us “to Trust in God” as if we have not. –a priest once asked us “what the hell we did wrong to cause all of this.” Yeah, I found someone else to go to for spiritual direction. –I heard often that “God never gives you more than you can handle”–Wrong, he does give you more than you can handle. This is why we need Him so much! In the Old Testament, Joseph, unexpectedly found himself victimized by the people he loved the most. As a boy of 17, he could easily have cried out, “Why would I want your God when you treat me this way?” He could have ditched his faith and joined a band of rebels. In today’s world, he would seem an ideal candidate for a gang member. What kept Joseph from turning against God? How did he overcome his disappointments, which were many, to the point of becoming a leader in Egypt? There were many facets of our lives that were crumbling–finances, health, legal issues and no matter how much I trusted, it all continued to plummet downhill. On numerous occasions, my husband and I needed to speak aloud, “Jesus, I trust in You” and prayed the Divine Mercy Chaplet often. On top of the above issues was the feeling of being discarded –from my faith family, from friends and from my work. It got to the point that I was feeling apprehensive about leaving the house. How do we climb out of our own pit of rejection? How do we continue to actively seek God when the weight of undeserved oppression threatens to drown us? There are several ways, but a most important one is to continue moving forward on your God-given pathway. There are many quitting places, but you don’t quit, you keep moving on, one step at a time for God. Along the way, I realized it was time to end some business relationships for other ventures. For years, I was afraid to let go. One day in prayer, I heard the Holy Spirit tell me that it was OK to spread my wings; that I could leave and He would take care of me. As I wrote my good-bye’s, I had a strong desire to leave without kindness. But suddenly, silently and yet loudly, I heard the Holy Spirit again in my heart. I wrote with kindness and grace. An hour after I left, there were two phone calls from two different companies, asking me to sign contracts with them. If only He did not have to teach me these lessons. If only I knew them instinctively. Perhaps though, this is how I continue to need Him. Joseph was sold by his brothers, then sold by the Ishmaelites, lied about in Potiphar’s home and sent to prison. He could have thrown his hands up and quit at any time. But he didn’t. Joseph consistently chose to follow the Lord, believing God’s invisible manifestations despite all visible evidence to the contrary. Joseph is the epitome of a victim who could have become hard as nails, yet Scripture goes to the trouble to record his tears again and again. He stayed tender when most men would have become bitter. God chose to use Joseph to spare the Messianic line. Joseph’s half-brother, Judah, the direct link in the bloodline to Jesus Christ, might have perished in the famine. God chose to use a sidelined offspring to salvage the Abrahamic promise and the coming of the Messiah. How did Joseph do it? What gave him the strength? I believe the answer lies in an addiction – with each trace of God he collected from his prophetic dreams and their interpretations, his craving for God revived and intensified. From one location to another, he continued seeking God through the use of his gift because he understood that it was God’s chosen avenue for him, and thus it was the best place to see God again. Never did God abandon him. In each new location, God consistently brought Joseph opportunities to use his gift. Trust God. He won’t forsake you, either. This entry was posted in Catholic, fairness, grace, social justice, trust. Bookmark the permalink.